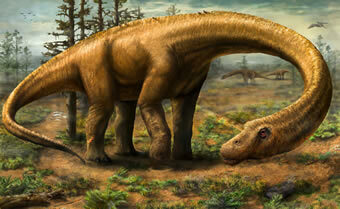 A giant titanosaurian sauropod dinosaur discovered in the Upper Cretaceous (Campanian Maastrichtian 84–66 Ma), Argentina. It is one of the largest of all known terrestrial vertebrates, possessing the greatest mass of any land animal that can be calculated with reasonable certainty using limb bone measurements. Dreadnoughtus schrani is the most complete gigantic titanosaurian sauropod dinosaur ever discovered, and the largest land animal ever known to have lived. 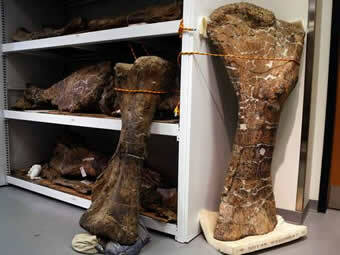 The majority of Dreadnoughtus schrani bones are very well preserved. There is minimal deformation, especially in the limb bones. Fine features, such as locations of muscle attachment, are frequently clearly visible. The bones in the photograph alonside are the femur and tibia bones. Dreadnoughtus is estimated to wiegh apprx 3000 kg more than a Brachiosaurus. Dr. Kenneth Lacovara, of Drexel University, discovered the remains in the Cerro Fortaleza Formation in Santa Cruz Province,Patagonia,Argentina in 2005. Due to the large size of the bones and the remote location where they were found, it took his team four summers to fully excavate the remains. Mules, ropes, hills, and many team members were needed to finally get the field-jacketed bones to a truck. In 2009, the fossils were transported to Philadelphia via an ocean freighter for preparation and study. Fossil preparation and analysis occurred at Drexel University, the Academy of Natural Sciences of Drexel University and the Carnegie Museum of Natural History. Dreadnoughtus schrani fossils will be returned to their permanent repository at the Museo Padre Molina in Rio Gallegos, Argentina.